The Atomic Squash board game library currently owns around 60 titles. These titles along with various titles owned by our members make up the Atomic Squash library at events. The titles currently support 3 area conventions, weekly board game days, Metro East Meetup Board game events, and various other Game Days and Events as requested. 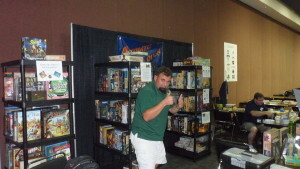 We try to make these games available to as many board gamers as possible through the year. The Library fluctuates from event to event due to title availability, but a majority of the Atomic Squash owned titles will be at these events.